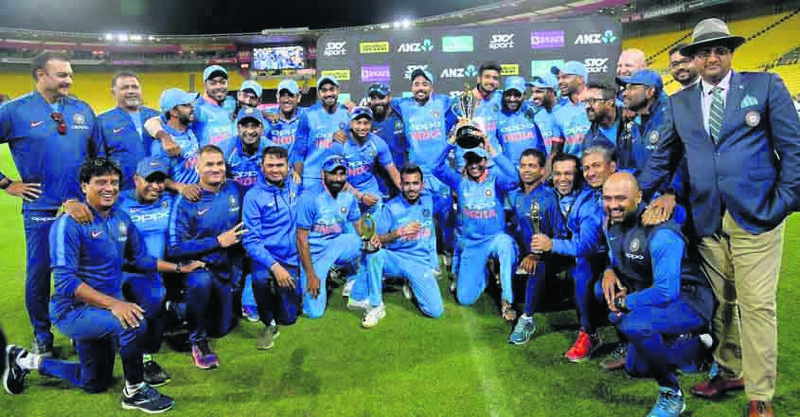 A knock of 90 by Ambati Rayudu rescued India from deep trouble and saw them beat New Zealand by 35 runs in the fifth and final One-Day International in Wellington on Sunday to wrap up the series 4-1. Captain Rohit Sharma opted to bat first instead of chasing totals down. They made a disastrous start and were four for 18 before Rayudu, with help from Vijay Shankar, steered the side to 252 and New Zealand in reply were all out for 217. India went into the match with an unbeatable 3-1 lead in the series and looking to atone for their sole loss, an eight-wicket defeat in the previous match at Hamilton. Four months away from the World Cup, the series highlighted the gulf between second-ranked India and third-ranked New Zealand. It did look as if India were heading for another defeat when Matt Henry and Trent Boult ripped out the first four wickets in under 10 overs. He had a life on 60 when dropped by Boult and was eventually removed when Henry, New Zealand’s most successful bowler, came back for his second spell. Hardik Pandya provided late fireworks for India with 45 off 22 deliveries, while Henry finished with four for 35. New Zealand batted through to the 45th over, which captain Kane Williamson described as “a step in the right direction” after being comprehensively beaten in the first three games of the series. Like India, New Zealand’s top order also went cheaply, before a 67-run stand by Williamson (39) and Tom Latham (37) for the fourth wicket. But after they went in quick succession Yuzvendra Chahal led a spin assault that saw the hosts all out for 217, with Chahal taking three wickets for 41 with all of them being leg-befores. New Zealand registered a face-saving eight-wicket win over India in the 4th ODI as Trent Boult took five wickets for 21 runs. New Zealand finally found conditions to its liking - hot conditions which made the ball swing - and in the absence of captain Virat Kohli and MS Dhoni, bowled out India for 92 in 30.5 overs. New Zealand reached 93-2 in only 14.4 overs, concluding the match before the scheduled dinner break. Ross Taylor made 37 in an unbroken 54-run partnership with Henry Nicholls (30 not out) to see New Zealand home, clinching the win with a six and a four from bowler Yuzvendra Chahal. "I think it was one of our worst performances with the bat for a long, long time," stand-in captain Rohit Sharma said.